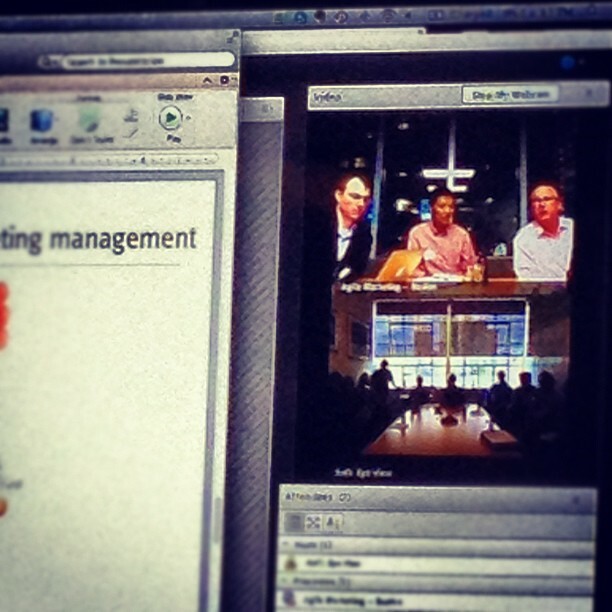 What do you get when you combine 10 marketers, a telepresence system, and some great food? You get the most recent meeting of the Agile Marketing meetup in Seattle – joined by some colleagues from Boston who stayed up after their meeting and shared their insights with us. Scott shared his principles of Agile Marketing management, and the key takeaways I gleaned from this meeting are that Agile Marketing is still fluid and interesting; that there are amazingly talented people in the field who are pushing it forward, and that there’s still a lot to figure out. Change is at Agile Marketing’s core – one of the tenets of the idea is that you should try (like in Agile Development) to determine whether your idea is good or bad about as fast as possible – which means the challenge of sharing Agile Marketing outside of your core team is a change management task. Good change management requires an understanding of the people, the processes, and the tools involved. The people are paramount: they are the actors who actually have to change (and who don’t always want to do something different.) The processes can enable or actually hinder change in a change management process – and likewise with the tools. So a good portion of the discussion during our meeting hinged around the idea of lining up the people with new processes and tools that guided them towards the principles of Agile Marketing but didn’t necessarily hew to the orthodoxy of the exact terms. In other words, successful Agile Marketing deployments aren’t really deployments – the successful individual, team, or project moves a project forward in an Agile way by spreading an ideavirus. If the idea spreads beyond the silo of the team/project/department, then it has the chance to transform the business processes of the organization and help that organization be more nimble and understanding to the change that’s already happening. But that’s the rub – to spread the idea beyond a small team, you need buy-in (enough space to try the idea), transparency (an experiment where everyone understands the actors involved, the goals and intent, the mechanism for change, and the measurement for tallying results), and the goods: results. If you start with the end in mind in Agile Marketing, you need to deliver a form of results in the language of the organization. And once you get one experiment going, running a hundred others serially or in parallel will get much much easier.